Kovair team is proud to announce the release of version 9.4 for all its products. The document throws a major light on some of the latest enhancements and the new features that have been added to all different products of Kovair in this version release. This release supports the deployment of Kovair on Windows Server 2008 R2 and above. Release 9.4 applications can be accessed by latest versions of Google Chrome, Firefox 54.0.1, and Internet Explorer 11.0. Currently all the adapter and event service configuration in the Configuration file are done by accessing the adapter server and physically exploring the file and changing it. In 9.4, This enhancement will allow Omnibus configuration user to perform the Omnibus Adapter Configurations as well as Event Service Configurations from the Central Interface itself. Moreover, the interface will also allow generic queries in Adapter level tables. The new Bulk Registration feature will enable system administrators to simultaneously register multiple tool projects directly from the Site level. The new feature eliminates the need of visiting individual workspaces at Workspace level to specify the projects that are to be used in the integration process. Prior to 9.4, any service flow initiated between tools would also include syncing of data-related comments and attachments from one tool to another. In 9.4, users can decide whether to exchange attached files and comments corresponding to a data during a service flow between the tools. Users can now control the movement of Attachments and Comments between tools through Service Flow Action Advance Options as given below. Kovair adapter for Slack helps to achieve integration scenario between Slack and other ALM tools, thereby enabling teams to collaborate, update and send notifications in real time across various channels. Integration with Slack using Kovair designed adapter enables team members to flow Channel records for individual entities into the target tool. Kovair Slack adapter ensures that all historical and current feedbacks are made available to each user with full context and in real time. For high priority release, this can be a very useful integration where information can flow very fast without even opening the bug tracking tool. Developers and Testers are notified also real time. With Slack mobile app, they can check issue status on the go. This can more useful where Developers and Testers are operating from two different geographical location and collaboration between two teams are tough. This can be very useful for DevOps scenario where continuous feedback is very necessary. Developer, Tester and Operations team can get notification and act very fast for each step. Operations team can be notified immediately at any point of time that build and deployment is succeeded of failed. The Kovair adapter for TFS 2018 helps to achieve integration scenario between TFS 2018 and other ALM tools, enabling teams to collaborate, update and send notifications in real time across multiple channels. Integration with TFS 2018 using Kovair designed adapter enables team members to flow data records for primary entities like Bug, Change Request, Epic, Feature, Issue, Requirement, Review, Risk, Shared Steps, Task, Test Case, User Story, Impediment, Product Backlog Item, Test Plan, Test Run, Changeset, File, Build, Build Execution into the target tool. Kovair adapter for Bamboo 6.6.3 helps to achieve an integration scenario between Bamboo 6.6.3 and other ALM tools. The adapter supports Entity Reflow, where the user gets to reflow those items from Bamboo which may not have reached the target tool with which the integration is being done but exists in Bamboo. The primary entities for which data can be fetched using Kovair Bamboo adapter are Plan, Job, Build, JobBuild, DeploymentProject, and Release. Kovair adapter for Confluence helps to achieve an integration scenario between Confluence and other ALM tools. Using the adapter, records created in the Page entity can be flowed into the target tool. With Kovair Confluence adapter, records of a page — such as comments and attachments — can be added, modified, and deleted. Kovair adapter for QA Complete helps to achieve an integration scenario between Defect management tools like SMARTBEAR QA Complete and other ALM tools. The adapter has support for two primary entities — Reviews and Defects. It supports synchronization of reviews and defects across other defect management tools and makes it more interactive through synchronization of review comments and attachments. Kovair adapter for JIRA Cloud helps to achieve an integration scenario between JIRA Cloud and other ALM tools. The Kovair adapter can help to fetch data from JIRA-related entities like Bugs, Epics, New Feature, Story, Improvements, Sub Task, Task, Custom Entities, Sprint, and Issue. JIRA Test Management adapter offers support like Custom Fields, System Fields, Attachment, and Comment for entity features namely for Custom Entities, Issues, and Sprint. Kovair ‘QuickSync’ is a desktop-based integration application for Windows environment. It is designed to provide primarily data migration as well data synchronization between HP ALM 12.53 to Jazz 6.0.5. One-to-Many Bidirectional Support: Kovair QuickSync has bi-directional data migration support. The data migration type between HP ALM 12.53 and IBM Jazz Suite 6.0.5 will be One-to-Many. Intuitive UI: Kovair QuickSync now has improved UI that has made it easy for users to view all log details from one single place. This eliminates the need of having to physically visit a directory for viewing log details. Multiple Database Support: The new release now includes support for SQLSERVER and ORACLE123 database types along with MYSQL, SQLITE, POSTGRESQL, DB2. Multiple Host Support and Host Management: Kovair QuickSync will now support a centralized database that can be connected to multiple Quick Syncs installed in multiple hosts. This will enable admins to view and monitor machine performances from multiple hosts through Kovair Quick Sync’s intuitive UI. Moreover data transaction rate multiplies based on number connected Host used for migration. In this release, we have introduced the capability of searching for a text across all related records. Users can mention the output entity of the search as well as the traceability chain where the search needs to be performed. Based on the settings, the search will be performed based on the text entered by the user. At the end of the search a hierarchical display will be provided with the results. These results can be viewed, exported as well as reset as per business need. In 9.4, entities created at Site Setup level can be linked to entities created at Workspace level. Relation lookup and section can be included in form section and form respectively at workspace level only and therefore relation lookup and section will be visible in end user mode in the forms of workspace level entities only. 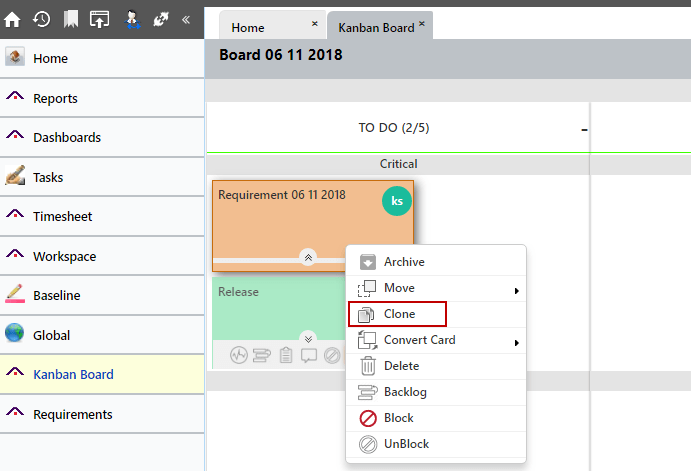 In Kovair 9.4, users can select multiple cards simultaneously and move them from one column to another column on of the same Kanban Board or to columns of different Kanban Boards. 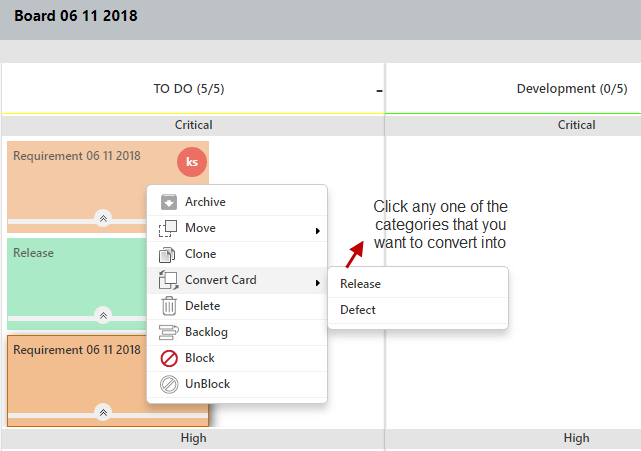 This implementation allows users of Kovair to convert a single card on a Kanban Board into another type of the same Kanban Board. This is applicable for any type of card that is added to the Kanban Board. The new implementation will allow users of Kovair to clone a single card of a Kanban board. By default, the new cloned card will be the same as the source card and will be added to the same column where the source card is situated. Users can now establish a relation between cards. 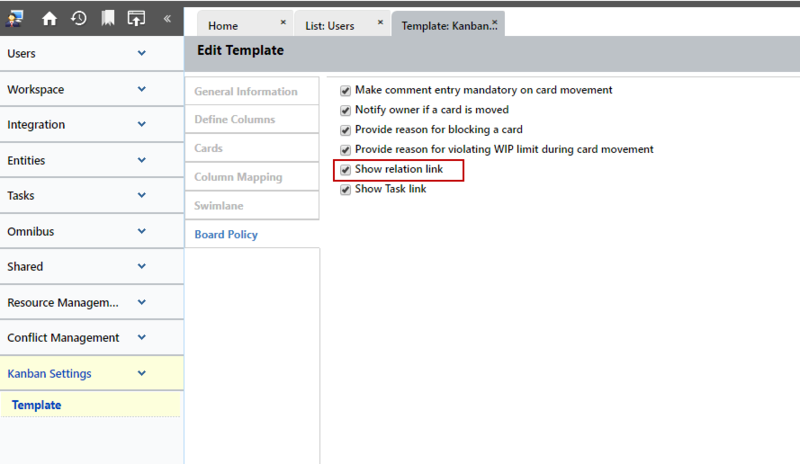 Based on the configuration, any card of a Kanban board can be linked to other cards of the same Kanban Board. The new implementation will allow records to be exported / imported in ReqIF format for a particular artifact. The exported file will have an extension of. reqifz. The implementation will allow end users of Kovair to view the items and the comments included during review from the ‘View Statistic’ page. Adding or editing values in the rows and columns of matrix level fields is a new enhancement that has been introduced in 9.4. During matrix level field creation, users can set only the column header name and the row header name from Workspace Setup. Values corresponding to the column header and row header of matrix field can be added or edited later from the end user mode. Kovair ALM Studio 9.4 introduces eight out-of-the-box report templates that target specific criteria for ‘Releases’, ‘Builds’, ‘Sprints (Iterations)’, and ‘User Stories’ along with the desired overview. The ‘Total Release Duration — Automated vs. Manual Task %’ report shows the percentage comparison of time spent on automated (process) tasks and manual tasks with respect to a selected release. It also shows the total time spent with respect to the selected release. This report clearly points to your release efficiency by showing how much of the release time is being spent on manual tasks and the time savings you achieved by automating a release process. The Average Duration of Releases Over Time report shows the average release duration of all completed releases with in a selected date range. The release duration will depend on the system defined date-time fields, the Actual Start Date and Actual Finish Date. The average release duration will always be represented in days. A release’s completion date determines the month that it is included in; for example, a release that was started in March and completed in May is included in the averages for May. This Average Duration Deployment report shows the average duration of successful deployments over time. This helps to see whether an organization’s deployment efficiency is improving over time or not. A successful deployment’s Actual finish date determines the duration date that it is included in. Throughput Chart shows the number of work items that have been accepted over a period. If the report considers defects, then defects having associated user stories and standalone defects both will be considered in the graph. The report displays accepted work-items with respect to the selected interval with no label on both x-axis and y-axis. It does show the legends “yes” and “no” which signifies the linked user stories. Work items with linked user stories are signified as “yes” and standalone are signified as “no”. Release Completion — Planned vs. Completed report compares the release planned completion dates against actual completion dates with respect to the desired date range and interval. This helps to visualize an organization’s plan and actual release track. This report will show data as per the date ranges (with respect to the interval chosen with no label) on the x-axis and the release count (with the no label) on the y-axis. Test Execution Burndown Chart shows the number of changes for test cases against the number of test cases created with respect to the desired date range and interval as selected. On drilldown the report shows the items belonging to the categories as clicked upon giving their Id, Title and the Current Status. The drilldown count may not match with report overview count when interval is considered as week, month and year. Active Summary Test Case report shows the rate of test execution along with the details for total unexecuted tests along with the expected completion date with respect to the date range and interval as selected. This report shows data with no label on both the x axis and y axis. The average rate of execution and expected completion date is displayed on hover at any point of a given date with in the shaded bordered region. Duration in decimal: Values in the duration field can now be entered in fraction. Acceptance of More than One Predecessor Value: A work item can be dependent on more than one work item and in that case, more than one predecessor value would be required. In 9.4, users can enter multiple predecessor value, each separated by a semi-colon, which is the list separator. Validation of Work Item IDs: Only values of existing work item IDs will be considered as valid predecessor value. The implementation will enable administrators of Kovair Data lake Portal to ‘restrict / allow’ users to each EazyBI Dashboards. Administrators of Kovair Data Lake will be able to specify user wise access control to each EazyBI Dashboards. Therefore, while administrators have accessibility to view all the dashboards, general users will be able to view only the dashboards to which they have accessibility rights. This implementation will enable data and their interrelationship to be fetched from a specific tool project to Data Lake using extractor, thereby allowing Data Lake users to create Models and perform detailed analysis. 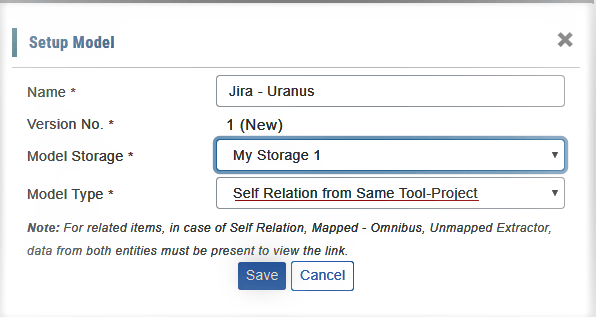 For example, if we consider that data is being fetched from Jira, Project – Uranus. From Jira, a relation can be drawn between Bugs, Features and with any custom type. While creating a model, one has to select a model type such as “Same Relation from Same Tool-Project”. The implementation will fetch the data from Omnibus – Kovair Integration platform and will allow users to view the logically mapped items across tools. Let say, using Omnibus one defect of Jira tool can be synced to Quality Center. Then using this type of model one can link these two same record of different tools. While creating a model one has to select the model type as “Mapped-Omnibus”. Based on transactions, Data Lake can typically store data in Chronological order. While prior to version 9.4, users could view Historical Data, that is, if a data was modified, then Data Lake stored both the modified version of the data as well as its previous versions. Version 9.4 has provision for viewing Recent Data (that is, only the modified version of the data) as well as the Historical Data. Often big projects require multiple tools usage. In that case, multiple cross-vendor tools are used for requirement management, defect tracking, etc. In this kind of scenario, there is no way for the Management to view the complete Requirement to Defect status or other metrices. In addition, it is also not possible for manually link the discrete items. In such scenarios, the Kovair Data Lakes acts as the simplest solution. Data Lake allows users to create mapping rules that match attributes from cross tool. Using Data Lake service, the mapping is created and put inside a model of type ‘Unmapped Extractor’. In 9.4, each of the models in Data Lake have been exposed using Rest API end point. The end points will allow data to be fetched from Model in Pages along with the relationships obtained during model creation. In 9.4, fields and forms can now be configured from the workspace level only. The enhancement will allow users to custom design a form page using Workspace object fields.